Poolside structures include a bathroom for convenience, and a place providing privacy to change, or dry off after swimming. Many times they include an indoor or outdoor shower for rinsing away the chlorinated water from the pool as well. There is also another type of poolside structure intended more for entertaining called a cabana. Cabanas provide outdoor seating and lounging space, while also including bar style seating and perhaps an outdoor kitchen and/or wet bar. Poolside structures in recent years also include outdoor fireplaces for a dramatic effect when entertaining poolside in the evening or in the cooler months of the year. 494 Sq. Ft., Width 20'-1", Depth 26'-3"
93 Sq. Ft., Width 20'-0", Depth 15'-0"
99 Sq. Ft., Width 25'-0", Depth 23'-6"
61 Sq. 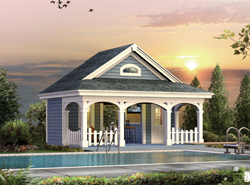 Ft., Width 24'-0", Depth 16'-0"
Our collection of poolside structure plans includes many great amenities for perfect outdoor living. We offer detailed drawings that allow the buyer to envision the finished project easily, right down to the smallest of details. With a wide variety of plans, we are sure that you will find the perfect do-it-yourself project to fit your needs and style.